Deputies have arrested a Clearwater woman for burglary after she was discovered by the homeowner inside her home with the Christmas card meant for USPS mail carrier. The burglary occurred at about 12:00 p.m. on Friday, December 22, 2017. Deputies have arrested a Clearwater woman for burglary after she was discovered by the homeowner in her home with the Christmas card meant for USPS mail carrier. 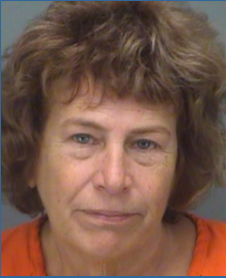 On Friday, December 22, 2017, deputies responded to the private residence of 74-year-old Roseanne Chiaramonte who reported a burglary to her home located at 1841 Keene Road North, Clearwater. Chiaramonte told deputies she left a Christmas card containing $25 cash for her mail carrier on the front glass storm door of her residence. Deputies say Chiaramonte discovered the suspect, 61-year-old Deborah Margaret McClung, standing in her laundry room holding the envelope that was meant for her mail carrier. Chiaramonte asked McClung what she was doing and McClung responded, "The mailman does not come down here, I will bring it to him." McClung opened the envelope. Chiaramonte asked McClung to return the envelope. McClung handed the envelope to Chiaramonte and left through the back door of the residence and drove away in a 2008 Toyota Solaris bearing Florida tag HBVK38. On Saturday, December 23, 2017, while patrolling the neighborhoods near the victim’s home, deputies say they observed the suspect’s vehicle and conducted a traffic stop in the area of Keene Road and Hercules. Deputies discovered addressed envelopes and mail from approximately 20 residences throughout the Clearwater area inside of the vehicle. They also found Amazon packages including fitbit fitness trackers and new clothing with the tags still intact. Deputies say McClung admitted to investigators she committed the burglary on 1841 Keene Road, Clearwater. McClung became uncooperative when asked about the mail and additional items found in the vehicle. McClung was arrested for burglary to an occupied structure and violation of probation grand theft other and was transported to the Pinellas County Jail without incident. The investigation continues and more charges are probable.